Your CRM Accounts can be accessed from the Main Menu, click on Accounts to view your Accounts – at first the grid will be empty. If you are just starting out and have just a few Accounts to load you can add them one at a time using the “+ Add” button on the right hand side of your screen. If you have existing data on another system you can import the data in bulk. If you have more than one user you can sort your Accounts by My Accounts, My Group’s Accounts and All Accounts, using the dropdown menu located next to the Search bar. You can sort your Accounts data by clicking on the column titles or field names (e.g. Account Name, Source), or you can search for the information you want using the Search bar. Using the predictive search feature you can search for any detail within the account by typing a key word in the search box. The predictive search will return a list of any accounts that match your search as you type and these will be filtered the more of the word you type. 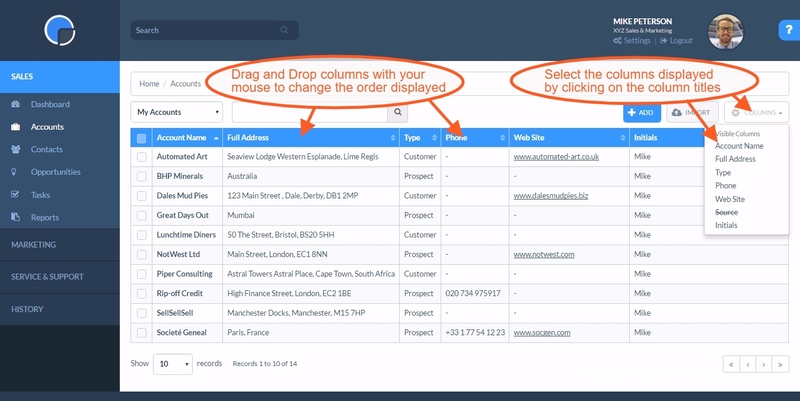 You can select which columns display in your data tables (e.g Accounts, Contacts etc.) by clicking the Columns button and selecting/de-selecting the column titles from the dropdown menu. You can change the order of the columns of the data tables by simply “dragging and dropping” from the column title bar. Depending upon the size of screen you are viewing on, you may need to de-select some columns to display the columns before you can drag and drop. Clicking the “+” icon for each account, on the far right of the grid, will open the data held in the columns not visible on your screen. Click on the Account Name to open an Account. Letting your cursor hover over the Account Name will show a pop-up displaying the Account’s notes. See Adding & Editing Acounts. You can create a new Account by clicking on the ‘+ Add‘ button. You can use the bar at the bottom of the table to view more Accounts per page and skip to the next page, previous page, first or last.